What will happen to Historic Fort Snelling, the anachronistic product of Minnesota’s Statehood Centennial celebration of 1958? It is hard to read the tea leaves at the Minnesota Historical Society these days, especially from a distance, but the proposed cuts at the Historical Society give some suggestions. It may be that in the very near future, beginning July 1, 2009, Fort Snelling will shut down so that careful work can begin to remove 16% of the walls of the fort. It would be a good start. But maybe this is all wishful thinking. 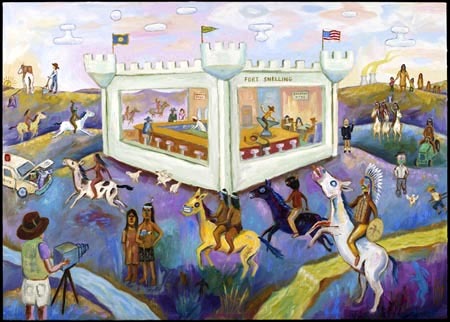 Ojibwe artist Jim Denomie's playful view or critique of Fort Snelling as a White Castle hamburger stand, with an Edward Curtis paparazzi in the foreground, a Minnesota state seal come to life in the background at left, and many other trenchant historical references; reproduced with the permission of the artist. One of the many unhappy announcements in the last few weeks of budget-cutting news was that Heather Koop, southern district manager of the Minnesota Historical Society’s Historic Sites Department, was among those slated to be laid off, assuming the Historical Society has to cut 16% of its budget. This announcement has implications for what happens at Historic Fort Snelling since Koop was among the few people in a position to accomplish anything, who was actually confronting the issues about Fort Snelling and trying to make a difference. For the past few years Koop and others at the Historical Society had launched a discussion among many people about changing the nature of the interpretation at the historic fort. Interpretation at Historic Fort Snelling has focused on early nineteenth century military history, but a revitalization project hopes to broaden the history to include the complex relationships between the military and the Dakota people. Over the last year, a public participation process with Dakota people has been taking place across the American Midwest and Canada. The site is fraught with controversy. Today, Fort Snelling is the subject of on-going protests by some in the Dakota community that seek to “tear the fort down.” Other Dakota hope to develop a memorial or living commemoration to Dakota culture and history. It is a controversy characterized by historic divisions in the Dakota community: friendlies vs combatants, federally recognized groups vs those communities not recognized, treaty ratification and failure. Layer on a dominant narrative that has not paid much attention to these issues and there is quite a lot to suggest the power of place and meaning. In the paper Koop gave an effective critique of the way Fort Snelling had been interpreted in the past and why it was necessary to overhaul it. When the historic fort was reconstructed in the 1970s a living history program was developed and implemented. Costumed guides interpreted 1827 military life on the frontier, complete with period-appropriate armaments, uniforms, barracks, and domestic implements with washerwomen, soldiers, and blacksmiths performing daily rituals. First person interpretation was popular in the bicentennial ear with visitors eagerly immersing themselves in living history museums and historic sites around the U.S. and Canada. While visitors were taking a step back in time during their tours, the interpretive method and historic content did little to challenge visitor’s conceptions of the struggles of the time period let alone their relevancy to contemporary times. Visitors perhaps walked away feeling the early medical science was a lot of guess work and procedures primitive or that more soldiers were bored than exhilarated by battle or that there was little in the way of equality for women. They most definitely did not leave the site with any better understanding of the issues of treaty making, the history of westward expansion, or the role of slavery in supporting the mostly southern officer corp. The limitations of first person interpretation did not allow interpreters to engage visitors with the bigger issues of the day. How could a washerwoman be expected to discuss with visitors the impact of the 1805 treaty that ceded hundreds of thousands of acres of land to the United States and changed the industrial economy of the Dakota Indians? How to explain that the residency of one slave and his wife at Fort Snelling would be the basis for one of the most important Supreme Court cases in United States history? How could we move from these singular perspectives to a dialogue about the broader impacts of history? The Society felt that there was great potential in moving beyond the tried and true interpretation at this site. . . . In order to devise a new interpretive plan, we looked to the public participation processes that are utilized by planners and adapted them for our purposes. In the rest of the paper Koop described the process itself, how she and other Historical Society staff began and carried on a discussion about the future of Fort Snelling with various groups which had varying interests in Fort Snelling. The process was based on a familiar trope of management theory–a “stakeholder analysis,” the identification of “any individual or organization that can place a claim on the organization’s attention, resources, or output, or is affected by that output.” Once stakeholders were identified, discussions were initiated with stakeholders as a whole and with groups of stakeholders. The first step was to find the right stakeholders. A staff-working group was convened to brainstorm a list of stakeholders. . . . We then asked ourselves, whom are we missing? Who else might be interested in a revitalized interpretive plan? Are there groups or individuals who we have purposely neglected? We wanted to know what the power and interest relationships were in relationship to one another. One useful stakeholder analysis techniques is the Power vs. Interest grid, which help to determine the potential coalitions that should be encouraged or discouraged and to provide information on how to convince stakeholders to change their views. The language here indicates the degree to which stakeholder analysis, like interest-group politics–is both calculating and judgemental. It also demonstrates how it caters to powerful groups and entities. And the way in which groups were identified in this case says a lot about the nature of the Minnesota Historical Society as an institution. The groups categorized as “Subjects” having a “high interest” and “low power” were: Staff and volunteers, Other local sites, Ojibwe community, Dakota community, History buffs, Re-enactors, and Archaeologists. In contrast, those categorized as “Players” having “high interest” and “high power” were considered to be: National Park Service – MNRRA, State Historic Preservation Office, National Trust, Fort Snelling State Park Association, DNR Parks, Senior Citizens, Daughters of the American Revolution, School users, and Sibley Friends [Friends of the Henry H. Sibley Historic Site]. Those “Context setters” with “low interest” and “high power” were: City of Mendota, Hennepin County, Mn. Dept. of Transportation, Donors, State Gov’t, Other MHS sites & departments, and Other area attractions. Koop writes that it is these last two “powerful” groups, not the Dakota or others in the first category, that were of primary importance in the process. These were the groups to be satisfied. Plotting the stakeholders on the Power vs. Interest grid graphically illustrates the quadrant that was most critical to success of the project. Those groups with both high interest and high power – players — and low interest and high power –context setters had to be satisfied first. The subjects and crowd had to be paid attention, as well, but our focus would be on satisfying those in the context setters and player categories. It is truly shocking to read this analysis and learn that the Historical Society placed Dakota people in the same category as historical re-enactors, history buffs, and archeologists, with less perceived power than the Daughters of the American Revolution. But for anyone who knows the way the leadership of the Historical Society has run the institution for the last 30 years and longer, these statements ring true. Throughout this time period the Historical Society has often sought to identify the powerful–defined in traditional “mainstream,” Master Narrative terms–and to cater to them. In fact, however, Koop’s paper makes clear that during the process of discussion Dakota people were actually given greater respect than indicated by the outlines of the stakeholder analysis; they were in fact perhaps the most important group of stakeholders of all. Perhaps this was a result of an evolution in the thinking of Historical Society staff members during the process. In particular they may have realized that the initial stakeholder analysis was faulty and that Dakota people, including several powerful Dakota communities in Minnesota were more more powerful in terms of achieving results than anticipated. Perhaps there was a realization of the importance of the Dakota Treaty of 1805 and the longterm claim and very tangible stake it gives Dakota people in the Fort Snelling Reservation. Or perhaps the Historical Society was influenced by a justice argument, realizing that because of what happened to Dakota people at Fort Snelling, Dakota people were different from Ojibwe people and historical re-enactors in terms of their claim on Historic Fort Snelling. Koop mentions many of the details of what happened historically to Dakota people at Fort Snelling. She and those working with her made a real effort to understand the positions of Dakota people about Fort Snelling and their concerns about how it is to be interpreted in the future. Although Waziyatawin, for one, would not engage in the process, Koop appears to have made an effort to try to understand Waziyatawin’s point of view expressed about Fort Snelling expressed in such works as What Does Justice Look Like? The Struggle for Liberation in Dakota Homeland. In addition, “deliberative workshops” took place with Dakota people in southern Minnesota. Koop and others heard that not all Dakota people pushed for the tearing down of Fort Snelling, but, “believing that the Society and other dominant cultural institutions had been disingenuous with Dakota history, they urged us to tell the truth about the treaties and dishonesty that led to war.” They learned that many Dakota people wanted this to be the beginning of a relationship that would lead to continuing discussion about the issues. At the time the paper was written Koop anticipated that the discussions would continue this year. Now however, if Koop were to leave it is not clear that these discussions can continue. From the Minnesota Historical Society website, a composite image of Director Nina Archabal in front of Historic Fort Snelling. A few years ago, Fort Snelling was said, among people who knew things about Fort Snelling, to be “the next big thing.” By this it was meant that the fort would become the focus of attention and money. Over the last 25 years this has meant primarily one thing: construction. Among the previous big things were the History Center and the Mill City Museum. In building buildings, the Historical Society appeared to believe it was building a brighter future for history in Minnesota. Several years ago the Historical Society hatched plans to build a new interpretive center at Fort Snelling, which, it was hoped would, among other things, solve the nagging interpretive problems at the fort. But in this case, attempts to raise money at the legislature for a new Historic Fort Snelling interpretive center have met with many obstacles over the last few years, including finally, the effects of the current recession. Heather Koop’s work in mediating a solution for Fort Snelling was to be part of the same process involving the new interpretive center and it continued even after the interpretive center plan was put on hold. Now it appears that even her work will stop. Perhaps the problem with the Historical Society’s building plans for Fort Snelling is that the problems with the fort are not ones that more building can cure. There is no way that Fort Snelling can ever fit into the kind of happy, upbeat, nostalgic, popular message some in the leadership of the Historical Society seem to favor. But even some of the scenes of the Holocaust in Germany have museums, so perhaps something could be done to make Fort Snelling into that kind of Museum for the Dakota experience. It may be hard to imagine this ever happening under current leadership of this Historical Society, but something of this kind should be on the table for discussion about the future of Fort Snelling. In the meantime, perhaps the best thing to do, for all sorts of reasons, including the budget crunch, would be to shut down Fort Snelling for a few years, to give it a rest. It is an attractive idea, especially with the upcoming 150th anniversary of the events of 1862. Perhaps Fort Snelling should be closed so that all the stakeholders can think about its future. Then in a few years, perhaps the solution about what to do with this stony anachronism will be clearer.